As expected November was another slow month for detached homes in the Vancouver real estate market. For the fourth consecutive month detached homes remained a buyers market. New listings slowed significantly as sellers gear up for the winter holidays and postpone selling until the New Year, as is typical around this time of year. Sales continued to collapse, falling well below the 10 year average for the month of November. Buyers appear hesitant to pull the trigger, the homes that are selling are the nice homes in good locations that are competitively priced or willing to take a significant reduction. As you can see in the table above, detached sales fell year over year by 46% in Vancouver East, 58% in Vancouver West, 64% in Richmond, 57% in Burnaby, and 52% in REBGV (Greater Vancouver). More importantly, sales are also well below the 10 year average. 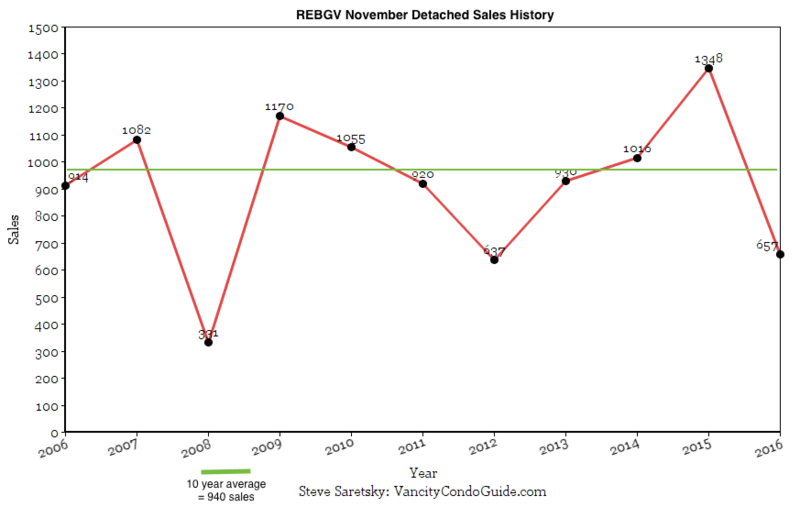 As per the chart below, REBGV detached sales are 30% below the 10 year average. November Detached Sales 30% Below 10 Year Average. New listings in the detached market followed seasonal trends. At this time of year most sellers choose to wait until the New Year to list. New detached listings in REBGV for November were 2% below the 10 year average. Anything below 14% is considered a buyers market. REBGV detached sales dropped 2% month over month while inventory fell 20% month over month, this brings the sales/actives ratio to 14% up from 12% in October. Many frustrated sellers have taken their house off the market and will attempt to re list in the New Year. All areas were above 6 months of inventory which also indicates a buyers market. Prices continue a downwards trend. As the detached market hits it’s fourth consecutive month in a buyers market this keeps a downwards pressure on prices. Again, average and median will fluctuate month to month. Prices whether going up or down do not follow a simple vertical line. As per the average price REBGV detached prices are down 11% since January, median sales price shows a 12% decline. The detached market continues to favour the buyer and will likely remain that way for the near term future. Don’t expect much to change over the slow winter months. A key indicator of price corrections are when sales drop. Sales are now trending 30% below the 10 year average with inventory sitting at normal levels. This will continue to put downwards pressure on detached home prices. Most areas are showing average and median price drops of anywhere from 10-20% from the peak in late spring/early summer.